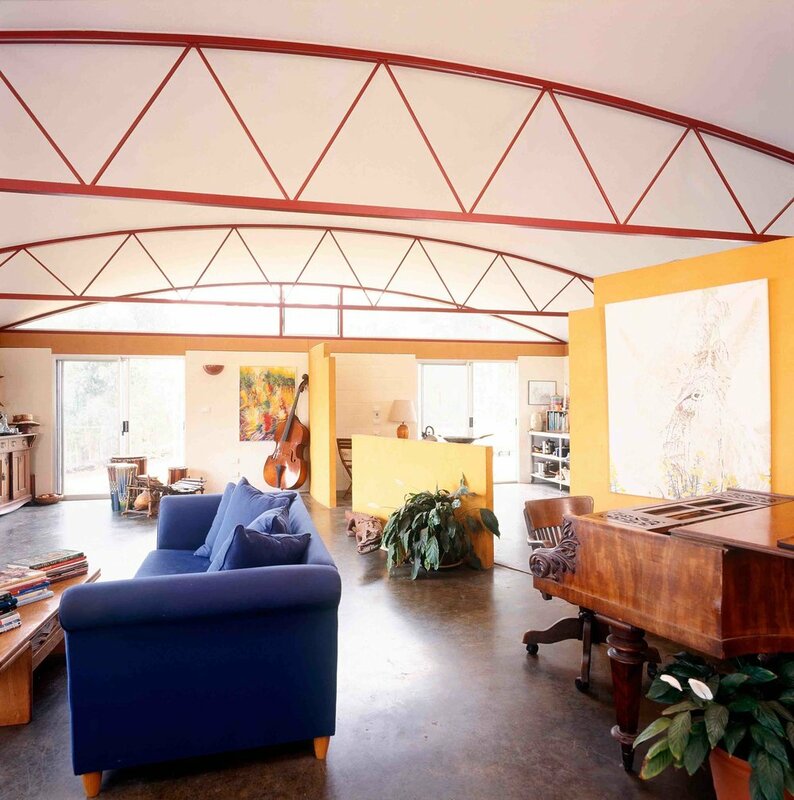 Four Horizons House, Watagans National Park, Hunter Valley, New South Wales, Australia. 1994-2004. On 100 acres of eucalypt forest at top of 60 m cliffs, 430 m above sea level. Spectacular views over the Hunter Valley wine region. No public services. Extreme bushfire danger. Electricity from photovoltaic solar array. Water from roof to corrugated steel tanks. Water heating from solar panels. ‘Brown’ water to septic tank. ‘Grey’ water irrigates a walled ‘Permaculture’ garden. Wood stoves for heating and baking. Mobile phone and fax. Three buildings - house, garages, stables. House parallel to the cliffs faces 33˚ east of solar north - winter morning sun, cooling summer sea breezes. Walled garden orientated on the points of the compass. Thus generated the courtyard. House, corrugated steel ‘fly roof’ on standard steel agricultural shed frames - large low cost area for rainwater and shade. Beneath are two habitable modules with curved steel sub-roofs either side of an open breezeway with retained existing recycled brick fireplace. 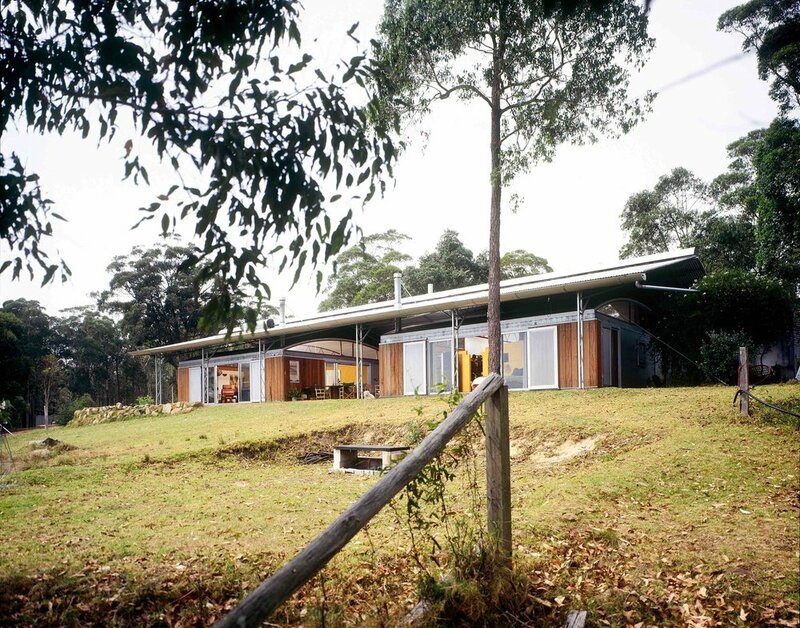 Concrete block walls for thermal mass insulated and clad on outside with mini-orb steel and eucalypt planks. 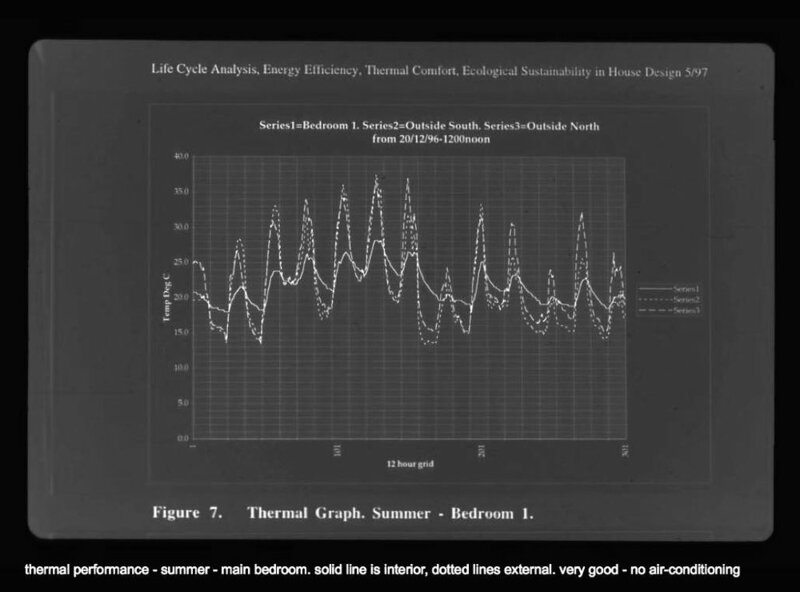 Eaves exclude summer sun, winter sun admitted to thermal mass of concrete floors and yellow curved thermal wall. Perforated mini-orb steel shutters for bushfire protection and sun shade. 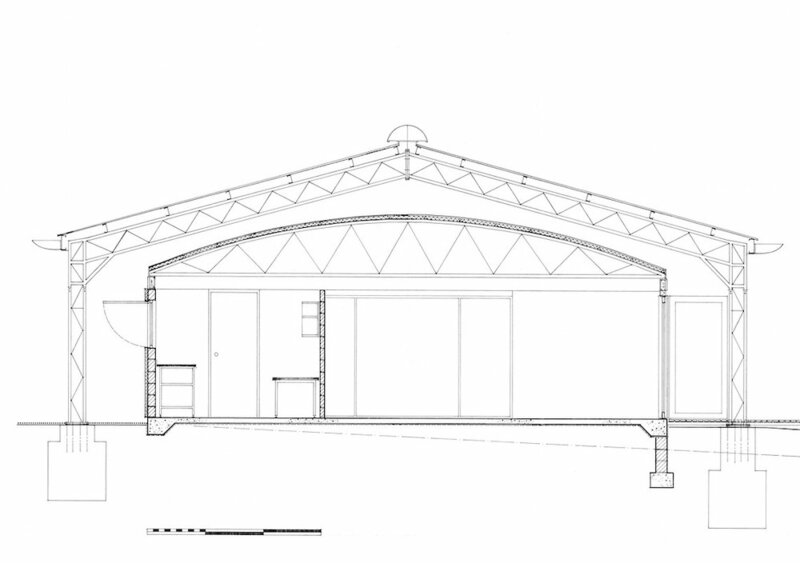 Standard steel shed frames to garages and stables with roof and walls of corrugated steel. Bloodlines from Australian rural sheds. Low cost. Owner built. The vented 'fly' roof and eaves overhangs neutralise the worst of the heat of the summer sun, and the thermal mass and insulation keep the interior temperatures at acceptable levels. The breezeway allows summer north-east sea breezes to pass through the centre of the house. Water tanks have been located to the west of the dwelling where retained trees also cast summer shadow. The breezeway can be closed up on the south side - the house can thus turn its back to the prevailing southerly winds. 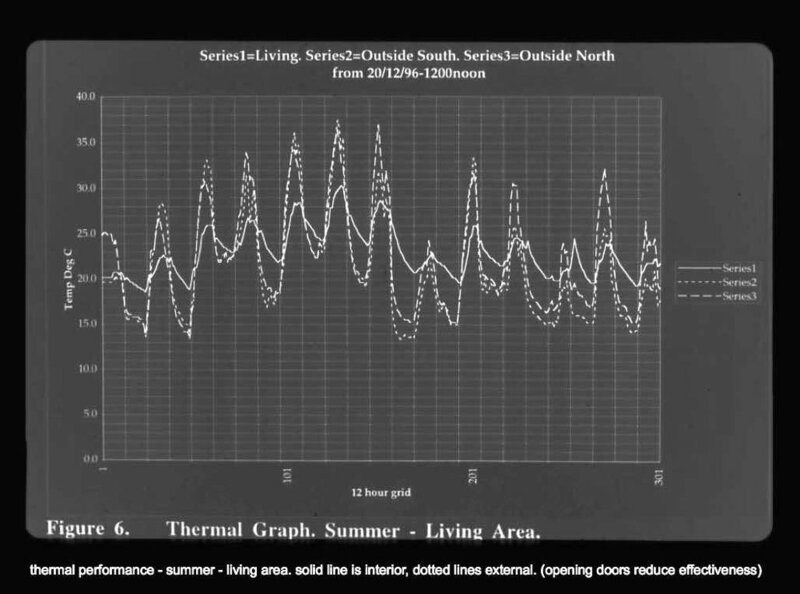 Systematic thermal monitoring recorded internal temperatures on a hot summer day up to 12º cooler than outside at 26ºC inside and 38ºC outside. On a cold winter morning the internal temperature is up to 10º warmer than outside at 14ºC inside and 4ºC outside. 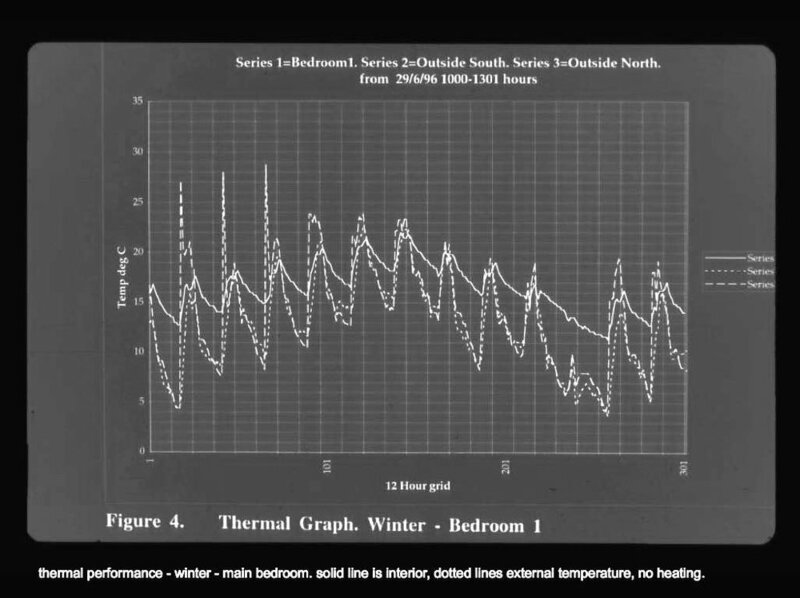 Both with no artificial heating or coolingA full embodied and utilisation energy audit was conducted as a university research project. 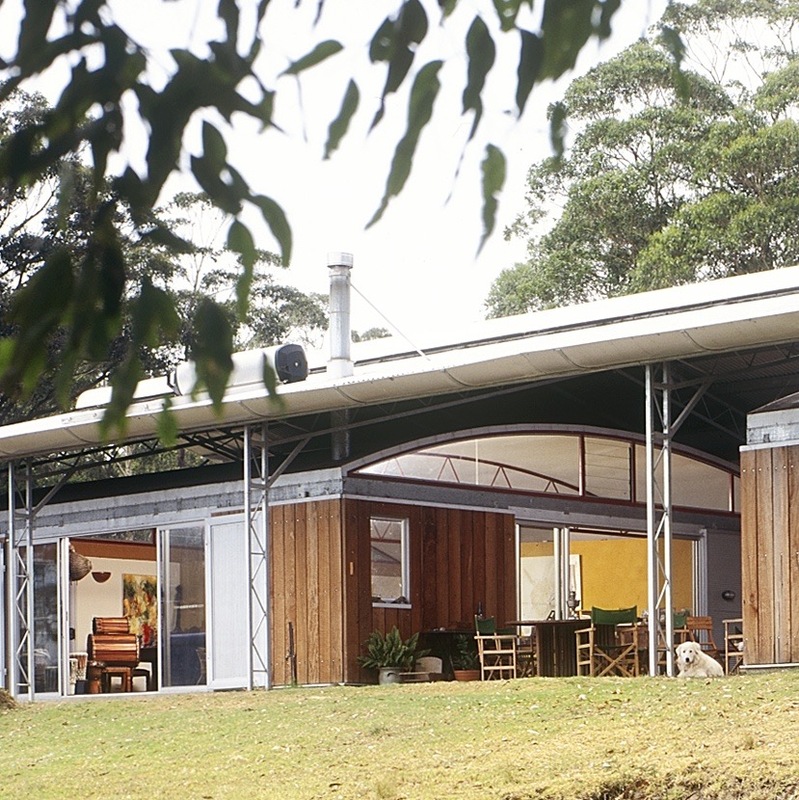 A “typical” Australian home emits in the range 15 – 23 tonnesCO2e/annum. 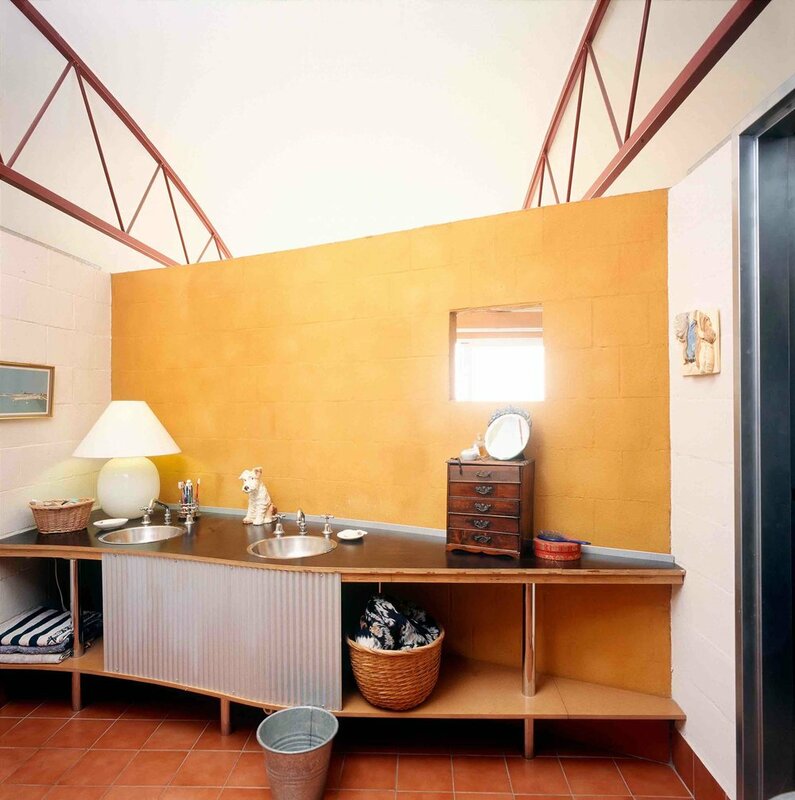 Four Horizons is in the range 20% - 30% of a "typical" Australian house. Photos : Michael Nicholson, Steve Brown, Lindsay Johnston.